Look at Mac (not Charlie, definitely not Charlie) from It's Always Sunny In Philadelphia. Doesn't he just look darling in that Strictly for My Ninjas shirt from VV? If you see Vintage Vantage on TV, please tell us! If it's news to us, we'll send you two free shirts! 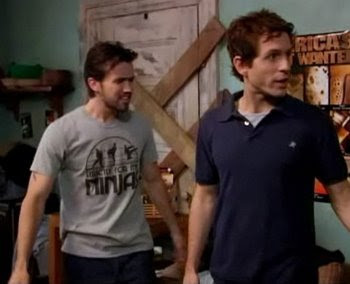 That's Mac wearing the t-shirt, not Charlie! Right-O! Mac...Charlie...Chac...Marlie...you know how it is...thanks anonymous.